Once upon a time, the shopping mall was at the top of the retail food chain. 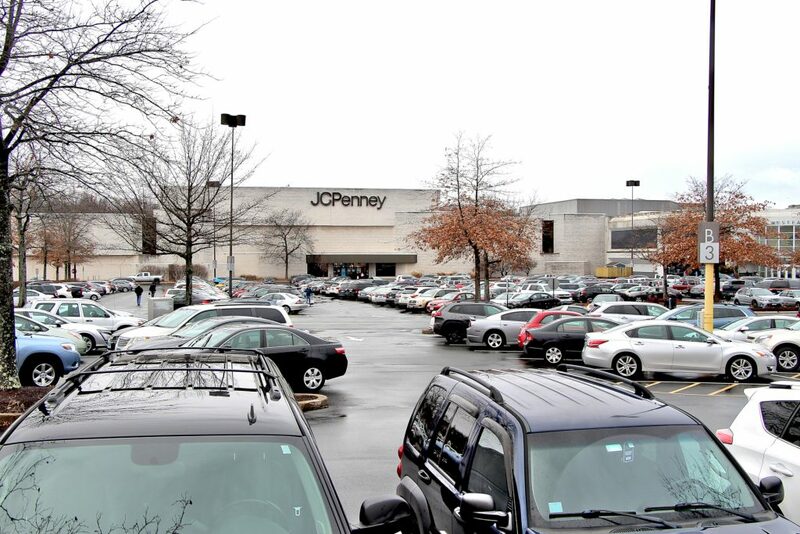 The mall was home to the best stores, and the most excitement. Amy and I grew up in the mall era. Our small town (population ~25,000) had its own little mall that kids hung out in, but it was not comparable to the shopping destinations that are available in Greater Hartford. Both of our families made the hours-long drive to larger towns with bigger malls for back to school shopping. Back in the day we went to the mall to buy clothes, electronics, and even tools at the anchor stores. There was always a toy store in the mall, but we usually weren’t allowed to go in there. And, of course, there were the delicious specialty food shops … Orange Julius anyone? Malls haven’t dominated the retail environment for a long time, as big box stores sprouted up in mall-adjacent locations decades ago. The crowds that turn up during the Christmas shopping season are a nice reminder of olden times when it seemed like everyone was at the mall. John Scobie, of Center Development Corporation, spoke to the Park Road Business Association this morning about his firm’s plans for the Sisters of Saint Joseph property on the southwest corner of Park Road and Prospect Avenue in West Hartford. Center Development hopes to build a 320 unit apartment community that will be called Arcadia Crossing. 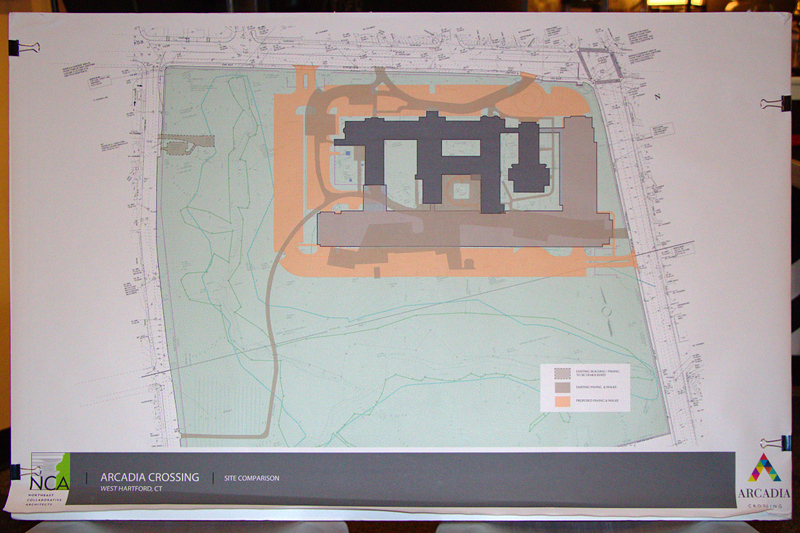 The existing 185,000 sqft structure would receive a 308,000 sqft addition to connect the southern end of the existing wings, and wrap around the eastern end of the chapel. Scobie said that the $90 million project is designed to include 60 studios, 120 one bedrooms, and 160 two bedrooms. It is a market rate project, and rents are expected to range from $1,400/month to $2,800/month. One of the unique features of the development is that the Sisters of Saint Joseph will remain on the site. 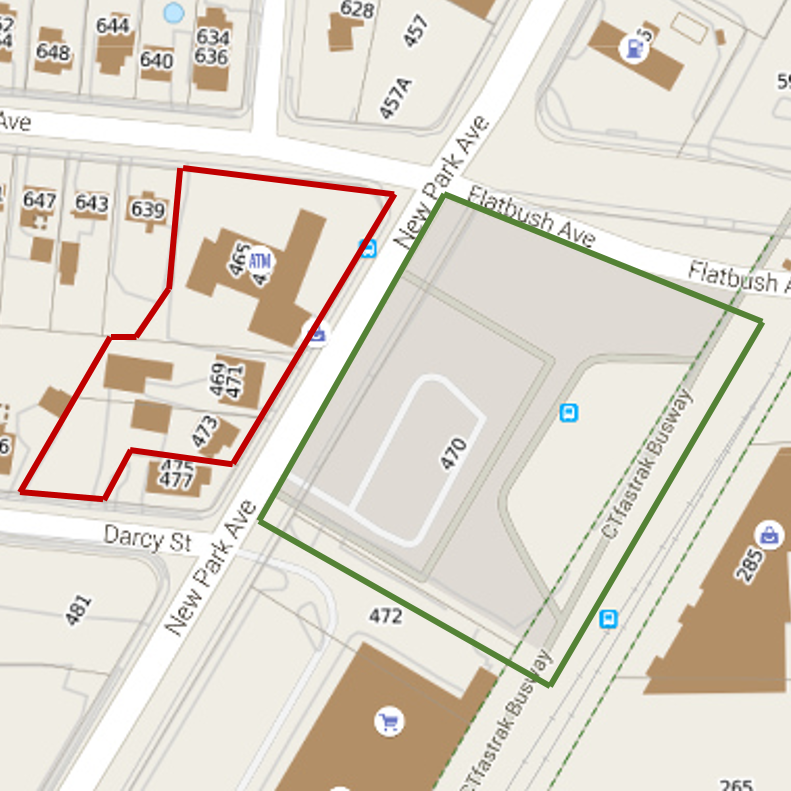 The property will be legally structured as a condominium community, but with only two units. 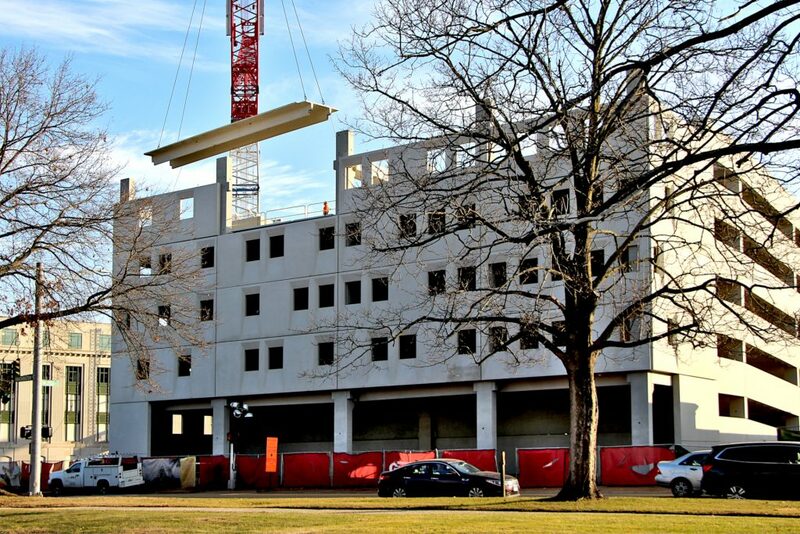 One unit will be the residences for the Sister in the west wing of the building. The other unit will be the 320 apartments and associated common spaces that will be managed by Center Development. Scobie highlighted two other constraints that were a point of emphasis in the design phase. Center Development wanted to maximize the amount of open space on the property, and has 14 acres of it in the current proposal. They also wanted to minimize the visual impact of the addition. The southern wing will not be visible from Park Road, and they have broken up the exterior design so that the façade is architecturally varied when viewed from Prospect Avenue. The current proposal calls for 549 parking spaces for the apartment residents (plus more for the Sisters). A two level parking garage will form the base of the southern addition, and will accommodate 295 cars. The remaining 254 spots will be surface parking. Community amenities will include a swimming pool, tennis courts, barbecue/picnic area, community “living room,” fitness center, yoga/pilates studio, and catering kitchen. Scobie said that Center Development plans to pursue the necessary zoning permits soon. They hope to begin construction in the fall of 2015 and be ready for occupancy in the spring of 2017. Last week, West Hartford Mayor Scott Slifka gave the 2015 State of the Town address at a West Hartford Chamber of Commerce event. The speech was an upbeat analysis of the Town’s priorities and current status; a thorough recap can be read here. One recurring theme was West Hartford’s forward looking focus on transit oriented development. Slifka said at one point that neither he, nor anyone else on the Town Council, were big fans of the Fastrak project that is passing through Town. The project is approaching completion, with service scheduled to start on March 28, 2015. 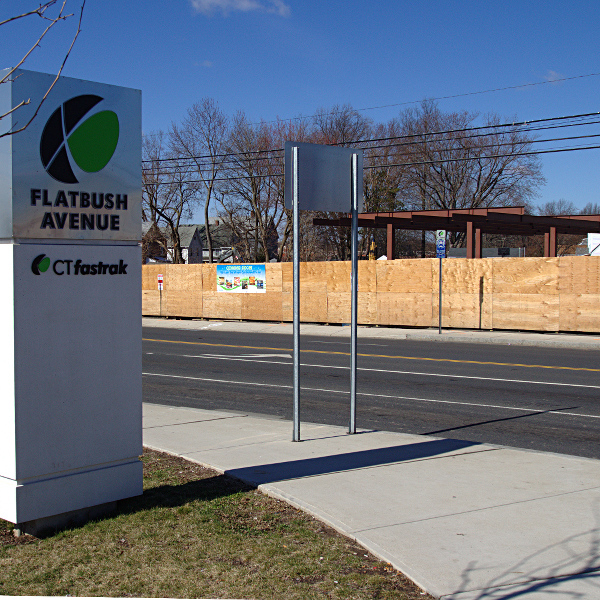 There are two stations in the southeastern corner of West Hartford – one at the intersection of New Park Avenue and Flatbush Avenue, and another at the intersection of New Park Avenue and New Britain Avenue. Despite a lukewarm opinion of the massive busway project, the Town has proactively taken steps to try to make it as successful as possible. Slifka said that zoning regulations along New Park Avenue have been modified to allow residential property uses. More important to Slifka was that train service continue along the busway corridor, and that West Hartford get a future train station. Slifka identified Brunswick, Maine, a coastal town north of Portland, as a place of interest. What resonated with Slifka was that some of Brunswick’s residents commute by train to jobs in Boston, which is about 130 miles away. He said employees that only need to be in the office one or two days a week are able to choose both the lifestyle of Brunswick, and the job in Boston. Rail service between the two makes that lifestyle possible. Brunswick Station is one end of the Amtrak Downeaster route, connecting through Portland to Boston’s North Station twice per day. The trip is advertised as 3 hours and 25 minutes, and there is currently one morning train and one evening train per day. There are five each day between Boston and Portland. Slifka felt that West Hartford, with regular train service in town, could provide a similar experience. He noted that both New York City and Boston would be within commuting distance of West Hartford, making the Town even more attractive to those types of workers. 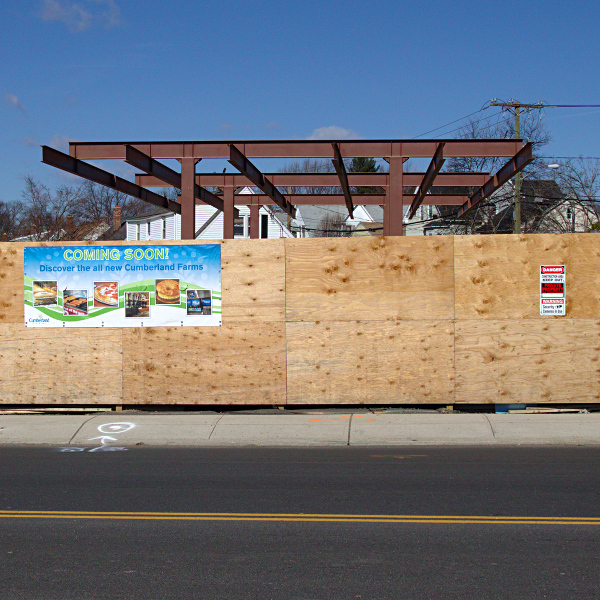 West Hartford sees an opportunity to capitalize on Transit Oriented Development, and is setting the bar high. The next step will be improving train service through the state, which is already under discussion.